After the last few months it was hard to know what to expect in Rafa's first slam event since Wimbledon last June. As the commentators are quick to point out at every opportunity, he has only played eight matches in the last 6 months and won just half of them. As he explained in his pre-tournament press conference, "I need to play better than I am doing. In order to play better, I need to win matches." It wasn't that encouraging to hear that his first opponent would be Mikhail Youzhny. Although their head-to-head is overwhelmingly in Rafa's favour, their most recent match (in Rome last year) was initially tough. Rumours abounded that Youzhny was not playing well, but we've all seen how the sight of Rafa on the other side of the net can bring out the best in an opponent. As it turned out, it was a straightforward win for Rafa. He only conceded one break point (which he saved) but managed to take 6 of the 11 break points he had on Youzhny's serve. The final score was 6-3 6-2 6-2. Can't show you highlights because they are restricted, so start as you mean to go on, I say. Herewith, the first gratuitous shirtless Rafa of the season. We had no way of knowing how the second round would play out since Rafa had never played Tim Smyczek before. All seemed fine in the first set but then Rafa started to suffer. Afterwards he explained it thus, "I felt very tired. I felt, I don't know. At the end of the first set, I start to feel my body very bad, very tired. I don't know. I was worrying crazy. Then when I was serving for the third, almost throw up. So was terrible feeling, no? I suffered too much on court for three hours and a half. I was suffering a lot. Too much." "What happened was a combination of things," explained his and the Spanish Tennis Federation's doctor Ángel Ruiz Cotorro. "He began to feel something was wrong with his stomach and he felt pain. Then he felt dizzy. Obviously, if you don't move there's no problem, but when you keep on playing you cannot recover fluids. He stopped drinking what he normally drinks. He only drank water and he also stopped eating," said the doctor who, along with Rafael Maymò his physiotherapist, has drawn up a programme to recover his tone against the clock. "I don't think it was heatstroke, but it is certain that it all got compounded. He began feeling bad in his stomach, then he began to lose all his energy, and he couldn't recuperate with certain liquids because he had a bad stomach and that's what caused the dehydration. The most important thing was to protect his stomach. When you finish a match, you normally take certain nutrients that help recuperation, all the loss of acids and other essentials, but in this case the required thing was to eat something light he could tolerate because he had gastric discomfort and felt unwell." It is testament to Rafa's extraordinary heart and will that he managed to come through the match, 6-3, 3-6, 6-7(2), 6-3, 7-5, in just under four and a quarter hours. And boy, was he relieved. 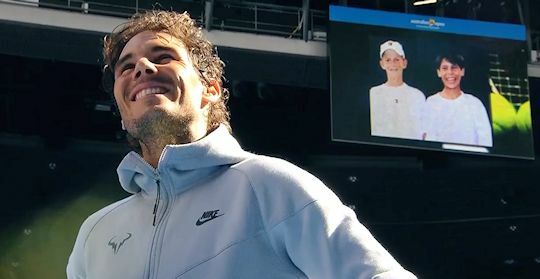 Considering the closeness of the match, it was a terrific gesture of sportsmanship from Smycjek to ask the umpire to give Rafa two serves after a shout from the crowd disrupted his first serve. Many players would not have done this at any point in the match, let alone in the final game. The next match was a bit of balm. Dudi Sela was another player Rafa hadn't faced before. This time, though, Rafa was fully fit and rested. He had it pretty much all his own way in the first two sets before taking his foot off the throttle slightly in the third. All was fine, though, and Rafa won, 6-1, 6-0, 7-5. I just love this image from the match. Here's a moment from the match. If you can find it, it's well worth watching Rafa's on-court interview with Jim Courier after the end of the match. It was just a delight. He was back in daylight for his fourth round encounter with Kevin Anderson who had been playing well all tournament. As always, Rafa did not underestimate his opponent. "Kevin Anderson is a big player, a big serve, very dangerous and he will be a very difficult opponent for me." That proved to be the case in the first set, but after saving 6 break points he finally got the breakthrough. He didn't face another for the next two sets and won the match, 7-5, 6-1, 6-4. In his on-court interview after the match, he was asked about the moment a ball boy had to replace his water bottle. He was also reminded that the pair of them go back quite a way. Before his first match, Rafa was asked how he fancied his chances of winning the tournament. "I don't feel myself ready to win the tournament here today," he replied. "If I am here in the press conference in one week, maybe I will say another thing." "I am one of the eight. That's the most important thing, no? I am in the last eight of the tournament. Seriously, for me, I cannot talk about that. I never talked during my career about that. But especially in this moment when you are coming back after a period of time where you were not on competition and you're going to play a very tough player like Tomas Berdych that he started the season great playing very well in Doha, and now he's here in quarterfinals. I don't know if he lost a set. I don't think so. He's playing great. Will be a very tough opponent, no? But for me quarterfinals is a great result, talking seriously. Arriving here, losing in the first round of Qatar, not playing matches for the last seven months, to have the chance to be in quarterfinals again here is a very positive thing for me. I'm very happy for that. I am sure that going to help me for the next events. For sure I going to try my best after tomorrow. I am not a person that I am happy like this and that's it. No. I try to play better and better every day. If that happens, I hope to keep having chances for the next match. But today is a day to be happy the way that I improved my level of everything, talking about tennis, all the things I have to do on court. I was closer today. Even if I played the first two sets the other day well, today I was much closer what I have to do to try to have success." There have been many different theories as to why he lost in the quarter final to Tomas Berdych, 2-6, 0-6, 6-7(5). Some journalists thought he might have injured his right leg and some cited Berdych's new coach having a game plan to beat Rafa. As always, it's best to read what Rafa had to say in his press conference. RAFAEL NADAL: Well, is probably not the day to talk about that. We talked enough about that before the tournament and almost every day, so is a day that I just can congratulate my opponent, accept that. Is obvious that I needed something more to be more competitive, as I did in the third. The third was the right set, the right game that I have to play. But is obvious that before I didn't play with the right confidence, with the right intensity, losing court, playing very short. I make him play very easy. So you cannot expect to win matches in quarterfinals of Grand Slam helping the opponent to play well. That's what I did. The first two sets, the beginning -- since the beginning of the third, I played with more character, more the way that I have to play to have chances to keep being -- to be where I want to be, to be where I have been for the last lot of years. I don't know how many. So that's it. Just will keep working hard on the things that I have to do. As I said when I arrived here, the process always is not easy. When you have injuries, are difficult the comebacks. There are so many examples around the world of sport that have been tough to be back. For me, I'm not an exception on that, no? I have to take the positive things. Without being at my top level of tennis I was able to be here in quarterfinals. Is not a bad result at all for me arriving here the way I arrived: only with one match, only with five matches in seven months. So taking the positive part, that's the thing that I have to take. That's just the beginning of the season, and I want to keep having chances to compete well against everybody. I need to keep working the way that I am doing for be ready for the next. The season is long, I know. Beginnings are tough. I need to be ready to accept all the situations that's going to happen or happened and try to be strong, accepting everything, and working hard to be back the way that I want to be. When I say 'be back,' I don't mean win or lose, I mean have the feeling on court that when you are there you feel confident, you feel you can compete against everybody with equal conditions. Well done to get as far as you did, Rafa.